OnTheMove allows you to access your existing transactional business applications on phones, tablets and PCs. Our background as a pre-eminent supplier of Siebel consulting means connecting to Siebel is a speciality, as is combining Siebel and Salesforce in a single App. 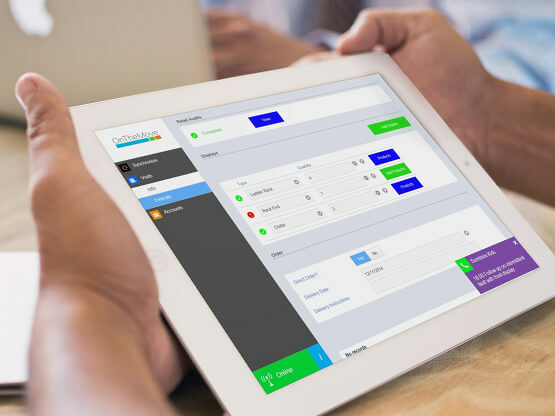 OnTheMove provides a superb modern user experience for all devices that will reduce training and support costs, and delight the users. Visit the OnTheMove Software website for detailed information about OnTheMove. Our extreme expert level Siebel and OBIEE consulting services allow our customer to maximize the value they get from their investments in these products. Siebel and OBIEE are extremely powerful products. The problem is that their reputation suffers because they are often implemented by teams who aren’t quite sure how to unlock that power. That’s where Customer Systems can help. Our services are tailored to each customer’s situation and range from running complete projects to supplying just a few days of expert knowledge to make an in house team more effective. We are experts in both the horizontal technologies and a wide range of industry vertical products. We use our skills to solve problems ranging from simplifying the user experience, to designing and optimizing interfaces, and to quickly upgrading to the latest releases of Siebel, OBIEE and Business Intelligence Applications. Our application support services are used by customers to efficiently support their configured versions of Siebel.